38 percent said human beings developed over millions of years with God guiding the process and another 12 percent said that development happened without God having any part of the process. Another 38 percent agreed with the statement "God created human beings pretty much in their present form about 10,000 years ago." Asked about the origin and development of life on earth without injecting humans into the discussion, and 53 percent said it evolved over time, "with a guiding hand from God." They were joined by 15 percent who agreed on the evolution part, but "with no guidance from God." About a fifth — 22 percent — said life has existed in its present form since the beginning of time. Most of the Texans in the survey — 51 percent — disagree with the statement, "human beings, as we know them today, developed from earlier species of animals." Thirty-five percent agreed with that statement, and 15 percent said they don't know. Did humans live at the same time as the dinosaurs? Three in ten Texas voters agree with that statement; 41 percent disagree, and 30 percent don't know. The most common religious denominations in the survey were Catholic and Baptist, with 20 percent each, followed by nondenominational Christians, at 10 percent, and Methodists, at 6 percent. Eight percent chose "spiritual but not religious," and 7 percent chose "other." Only 6 percent identified themselves as atheist or agnostic. An overwhelming majority said their religious beliefs were extremely important (52 percent) or somewhat important (30 percent). Only 35 percent go to church once a week or more; 52 percent said they go once or twice a year (29 percent) or never (23 percent). Church attendance isn't much different among Republicans and Democrats in the poll, though Republicans who do go to church say they go more often. More than half of the Democrats — 51 percent — go to church "never" or "once or twice a year." That's true of 45 percent of the Republicans in the poll. Forty-two percent of Republicans say they attend church at least once a week, compared to 35 percent of Democrats. Democrats (28 percent) are less likely than Republicans (47 percent) to think that humans have always existed in their present form and more likely (21 percent to 7 percent) to think humans have developed over millions of years without God's guidance. About the same percentages of Democrats and Republicans (40 and 36 percent, respectively) believe that evolution took place over time with God's guidance. Democrat Bill White's voters were the most likely to believe in evolution without a divine hand (33 percent); on the Republican side, by comparison, only 6 percent of Rick Perry's supporters were in that category. Has life on earth always existed in its present form? Republicans are more likely to agree (29 percent) than Democrats (16 percent). They're less likely to believe that life evolved over time with no guidance from God (8 percent to 24 percent). Democrats are slightly less inclined to believe in evolution with a "guiding hand from God" (50 percent to 55 percent). Republicans are less likely to believe that humans developed from earlier species of animals; 26 percent agree, while 60 percent disagree. Among Democrats in the survey, 46 percent agree that humans evolved from earlier species; 42 percent disagree. Perry's voters were most hostile to this premise — 67 percent disagree. About the same numbers of Democrats and Republicans — 43 percent — disagree with the idea that dinosaurs and humans lived on the planet at the same time. Republicans were slightly more likely to agree with the idea (31 percent to 27 percent). Perry had more voters in each group on the GOP side, but Kay Bailey Hutchison had the largest share of voters who believe in that coexistence. Prindle says the results recall a line from comedian Lewis Black. "He did a standup routine a few years back in which he said that a significant proportion of the American people think that the 'The Flintstones' is a documentary," Prindle says. "Turns out he was right. 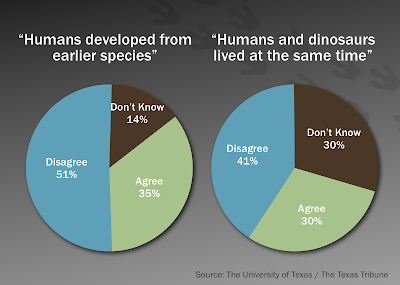 Thirty percent of Texans agree that humans and dinosaurs lived on the earth at the same time."